The original Super Monkey Ball game on the iPhone was one of the iPhone’s App Store early successes and SEGA is hoping Super Monkey Ball 2 is just as big of a success. The new version of Super Monkey Ball 2 game now is Version 1.2 looks much like the first version, but the first thing that is different is the user interface. The UI has a new feature in the lower left corner that shows the orientation of the game, it is used as a gauge to help you keep your money ball going in the direction you want. Keep it centered, he rolls straight, tilt it to the left, he turns to the right. This feature will help users from getting frustrated with the character going in a direction you weren’t expecting and should really improve the gameplay experience from the first version. Some of the new features of Super monkey ball 2 game for iphone, ipad and ipod touch that are included in Super Monkey Ball 2 are 115 new tracks and levels for users to try and conquer with their (same) favorite characters. Also up to four players can now play via WIFI against one another on any of the 115 maps. The Super Monkey Ball 2 iPhone game doesn’t have the same reception the original did in the app store (being one of the top sellers consistently for the first year of the app store). It’s current rating is 3.5 stars out of 5 on iTunes. Super Monkey Ball is now only $0.99. Personally I would wait to check the game out until it goes on sale if you want to get it for free, but for this price it’s almost free, and some updates fix some of the bugs. 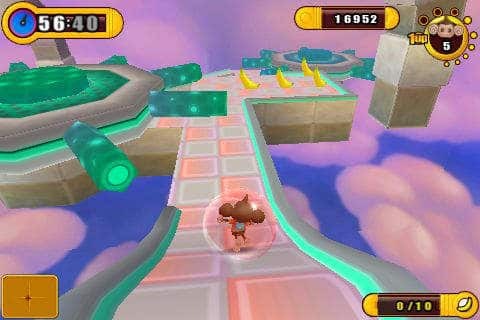 Grab this super monkey ball 2 from itunes apps store here.